Where Roots And Wings Entwine: Blokpod 2 in 1 toy storage and organiser review. 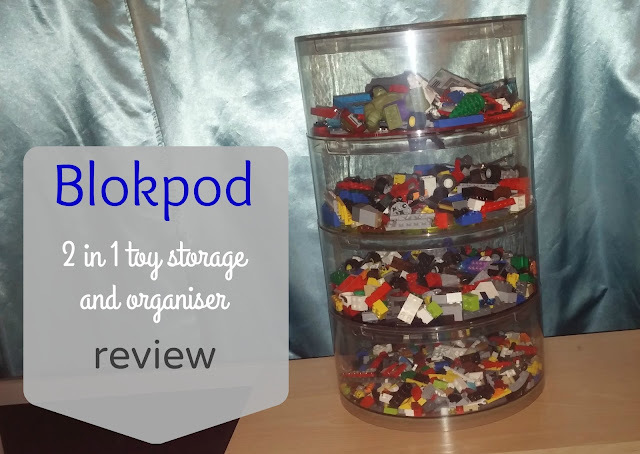 Blokpod 2 in 1 toy storage and organiser review. Bug is mad about Lego. 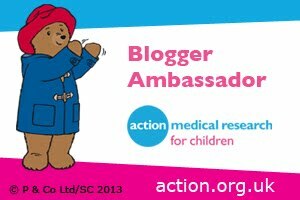 It is guaranteed to make any birthday or Christmas wish lists, and he always wants to buy more Lego with any money he has saved or been given. As he loves Lego so much and always wants more over the years his collection has grown considerably. Whilst it is great that he has a large collection of Lego for creative and imaginative Lego play the downside is that we have lots of Lego to store which can be a nightmare! 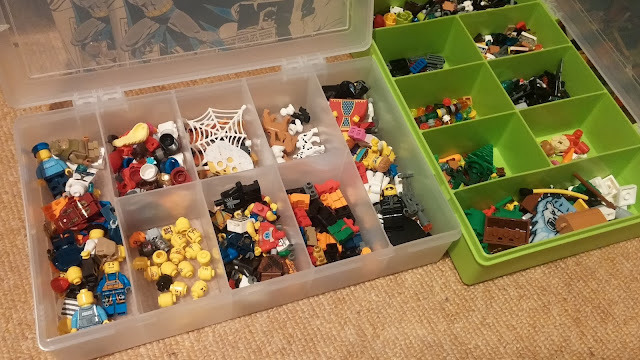 We have tried to store his Lego in different ways, with small partitioned boxes used to try to store his figures, accessories and small Lego pieces. Unfortunately though it is very rare that his Lego stays separated and in the excitement of play Bug forgets to put the smaller pieces and figures back in their boxes and they all end up mixed together in a larger store box. 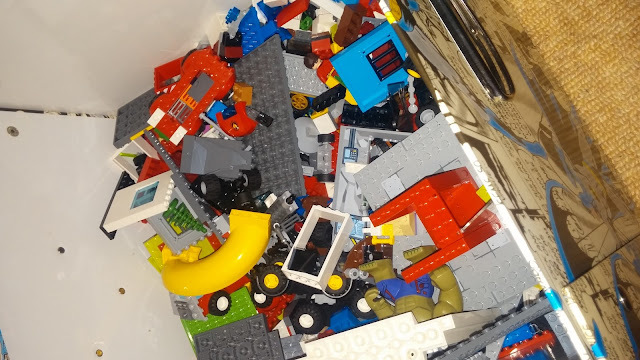 Whilst it is not a big deal that his Lego is all mixed together in one big box, the downside of it is that it is harder to find that special Lego piece he wants when building his Lego creations or a vital piece needed to re-assemble a Lego set such as the Lego City Police Station. In the hope of answering our Lego storage woes and helping us sort the different Lego pieces I jumped at the chance of trying the Blokpod. Blokpod is described as being 'the ultimate stackable 2 in 1 toy storage and Lego organiser'. 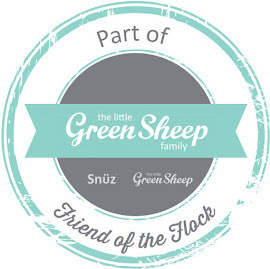 Designed in the UK it is safe for children to use thanks to it being ASTM and CE certified. 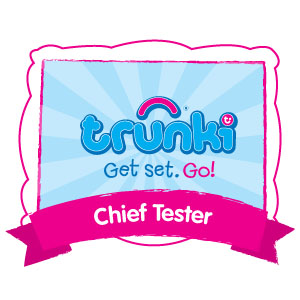 Confident in their design and product Blokpod comes with 15 years warranty. When Bug first saw his new Lego storage container he thought that it looked cool and loved that the clear cylindrical shaped storage container was an impressive 17” tall. The Blokpod is made up of 4 existing layers, which are separated by different grids which add a splash of colour to the transparent, glossy finish Blokpod system. Bug commented that the yellow, blue, and red grids looked like Lego block colours. When first handling the Blokpod it was apparent to see and feel that it is of high quality design and that the ABS plastic it is made out of is of very high quality. Thanks to the design and high quality plastic used in its construction I feel that the Blokpod is very durable and will withstand years of use, with it so far having easily withstood lots of rough and excited use by Bug. Incorporated within the Blokpod's design is a carry handle on the lid for easy transportation and even when moving the Blokpod filled with blocks it has easily handled being carried using the handle without putting strain on the storage container, lid or handle. Thanks to the Blokpod's stackable design Lego (or other toys) can be stored in one place without taking up extra floorspace which is a bonus when storage space is limited. With the Blokpod being able to store up to 600 Lego pieces per level, 2400 in total for the system we have, it is more than enough to store all of Bug's Lego collection for now. Not only is the Blokpod designed to be used for Lego and toy storage it is also designed to sort Lego too! Thanks to the grids separating the levels the Blokpod sorts Lego pieces of varying sizes, with larger pieces remaining on top and the smaller pieces falling through all of the grids to the bottom of the container. Sorting the blocks is simple and fun! 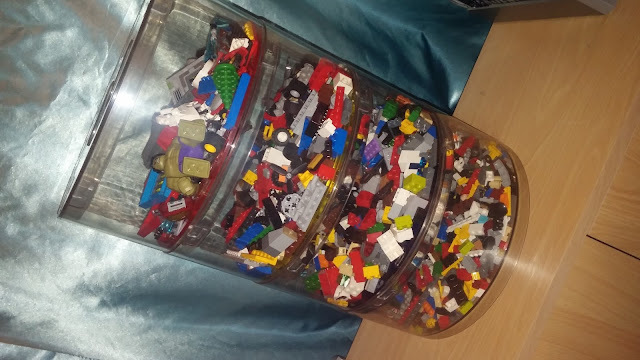 Simply add Lego pieces to the top level and then gently shake the Blokpod and watch the Lego pieces fall through the grids and get sorted thanks to the transparent container. Bug loves using the Blokpod to sort and store his Lego, with the Blokpod making tidying up more fun for him which means he is happier doing it and I don't have to fear it not being done and stepping on untidy-ed Lego pieces left on the floor....win, win! Bug loves seeing the Lego pieces fall through the grids and finds it very amusing when his figures get stuck in the grids. A bonus of the Blokpod sorting the Lego is that Bug has easily found pieces he needs for his builds and has even come across pieces which he had thought he had lost. The only slight niggle I had with the Blokpod was that at first it was extremely difficult to unlock the Blokpod's patent pending locking system. 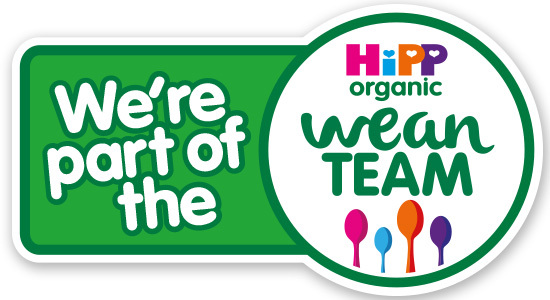 However with use this has eased and it has become smoother and easier to lock and unlock the lid and sections. The Blokpod looks great and Bug loves seeing all his Lego stored on display in the large Blokpod. Whilst we have yet to use any other way than Lego as Bug loves keeping his Lego inside of it so much, the Blokpod has unlimited storage potential, being ideal for storing other toys. As Bug and I love the Blokpod so much it will be loved and used for many years to come. As we love it so much and I am sure Bug's Lego collection is sure to grow over the years it is great to know that new grids and layers can be added to increase the Blokpod's size.